McAllen High celebrates a goal by Zoe Flores, right, off a corner kick against San Antonio Johnson during the first half of their Class 6A regional semi-final match Friday, April 13, 2018, at Blossom Athletic Center in San Antonio. McAllen High won the match 2-1. McALLEN — Valley boys soccer programs have totaled six state championships, but a girls team had never advanced to the final week of the season before this year. 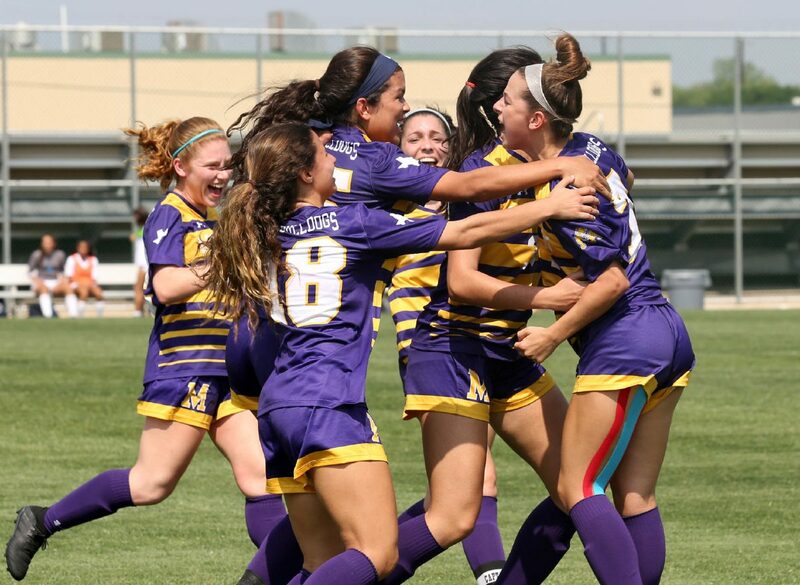 With two close victories at the regional tournament, the McAllen High Bulldogs became the first Valley girls team in history to reach the state tournament. They will face Houston Memorial in the Class 6A state semifinals at 9:30 a.m. Friday at Birkelbach Field in Georgetown. Success in most high school sports hinges the student-athletes’ work outside of the practice times permitted by the UIL. That means either training on their own time or, like many of the players on the Bulldogs roster, playing club soccer on a traveling team that faces top talent around the state or even nation. McAllen High's Zoe Flores moves the ball up field as Austin Lake Travis' Kaylyn Burnett chases her during the second half of their Class 6A regional final match Saturday, April 14, 2018, at Blossom Athletic Center in San Antonio. McAllen High won the match 1-0. Sola is part of the Bulldogs core that has played club mainly in the McAllen area. Most advance through the McAllen Youth Soccer Association, then through the Houston Dynamo youth development clubs. Gary Hamilton’s accent is thick, as is his dedication to growing and teaching the “beautiful game” to young players. The Scotland native, who played professionally with Middlesbrough F.C. in England, has lived in the Valley for more than two decades. Over that time, he’s been able to watch the sport grow for boys and girls. Recently, the girls have been impressing him at the club level. He directs and coaches the South Texas Houston Dynamo development program, which encompasses many age groups. He says the boys have always meshed with the culture and felt a love for soccer. Now, the girls are using that same obsession with the sport to excel. Club soccer isn’t a new revelation, but Hamilton said the number of girls participating has skyrocketed during his time in the Valley. He said the constant training from pre-elementary has allowed even young high schoolers to make an impact. 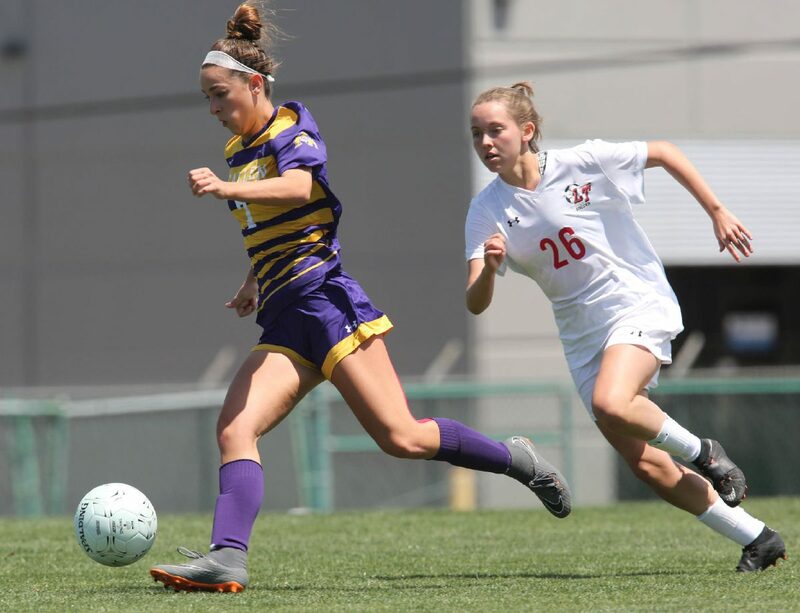 Zoe Flores, a midfielder turned defender in the latter stages of the playoffs, said club experience has helped her teammates bond and play without fear of elite competition. Club participation has grown in the Rio Grande Valley. The Upper Valley has clubs like the Dynamo, United Angels FC, Blue Angels and Sharks. Brownsville has also seen an increase in club activity with the growth of the Brownsville United organization. A hurdle that remains for many in difficult economic conditions is the price to participate in club play. A Valley soccer coach with daughters who play on club teams estimated that the cost exceeds $1,000 for training and uniforms alone, on top of the travel fees associated with qualifying for regional or national competition. Flores said the training against more physically imposing players has helped fuel McHi’s run. The Bulldogs hope to shock more opponents and bring home a state championship.